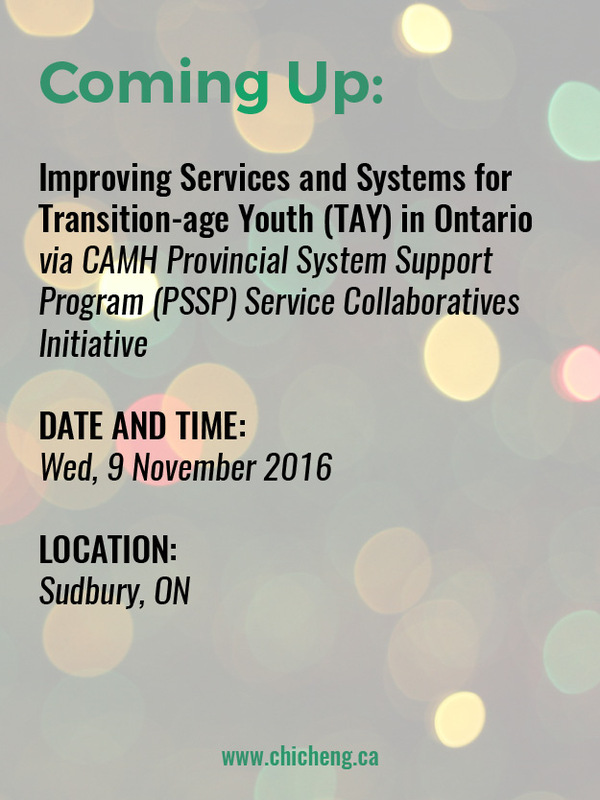 Dr. Cheng will be participating as a panel member in the Improving Services and Systems for Transition-age Youth (TAY) in Ontario knowledge exchange event on November 9, 2016 in Sudbury, Ontario. See below for details and registration links. This one-day knowledge exchange event is for service providers, persons with lived experience, family members, policymakers, researchers, and other stakeholders in Ontario’s mental health and substance use system. Attendees will learn about various initiatives and how CAMH’s Provincial System Support Program (PSSP), through the Service Collaboratives initiative, has been working with communities to improve services and systems for transition-age youth in Ontario. Dr. Manion is a clinical psychologist and scientist-practitioner who has worked with children, youth, and families for over 30 years. He is a clinical professor in the School of Psychology at the University of Ottawa and the director of Youth Mental Health Research at the Institute for Mental Health Research. Dr. Henderson is a Clinician Scientist and Director of the Margaret and Wallace McCain Centre for Child, Youth and Family Mental Health at the Centre for Addiction and Mental Health. She is also an Associate Professor in the Department of Psychiatry at the University of Toronto. This entry was posted in Education, Knowledge Translation and Exchange and tagged Canadian KTE, Northern Ontario KTE, Training & Webinars. Bookmark the permalink.